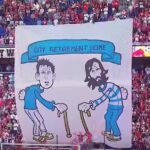 The LA Galaxy will host New York City FC this Sunday, so to prepare for the match, they decided to make fun of their fellow aging European talent collectors. NYCFC gave the Galaxy plenty to work with by allowing their big three — David Villa, Andrea Pirlo, and Poku Frank Lampard — to be photographed wearing white tank tops and looking greasy by New York Magazine for some reason. So the Galaxy recreated this shoot with Dan Gargan, Alan Gordon, and Nacho Maganto.